To that end, a group at UC Santa Barbara has explored methods by which currently cheap and abundant methane (CH4) can be reduced to clean-burning hydrogen (H2) while also preventing the formation of carbon dioxide (CO2), a greenhouse gas. 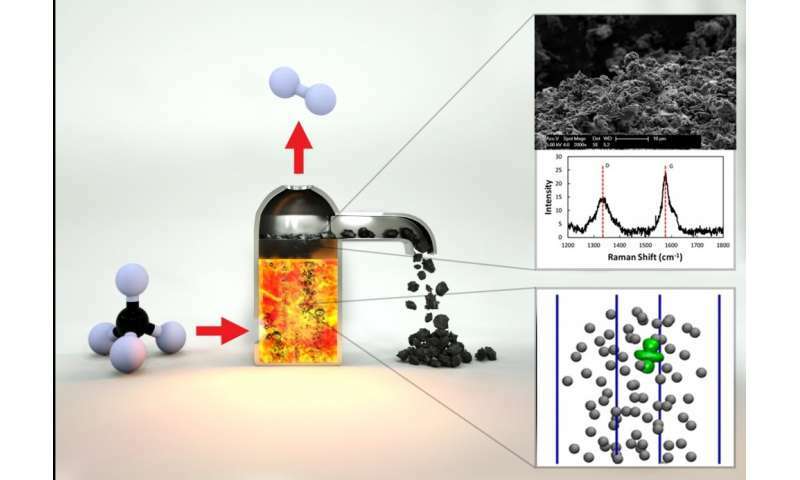 Its report, "Catalytic molten metals for the direct conversion of methane to hydrogen and separable carbon," appears in the journal Science. "In the U.S., methane will be the heart of our economy for four or five decades, and figuring out ways to use it more sustainably is what motivates us," said UCSB chemical engineering professor Eric McFarland. "This paper was an interesting angle on something we've been looking at for a long time." A product of both natural and man-made processes, methane—the primary component of natural gas—is an important source of fuel for cooking, heating and powering our homes and is used in manufacturing and transportation. As a waste product that is a more potent greenhouse gas than carbon dioxide, it is the target of many efforts to capture and reduce such emissions. Steam methane reforming (SMR) has been commercialized for decades and is the most common process for producing commercial hydrogen. However, the researchers point out, SMR consumes significant amounts of energy and necessarily produces carbon dioxide, which is usually released into the atmosphere. When the process was introduced, CO2 was not considered a problem. But as we became more greenhouse gas-conscious, it has grown into a global concern. The cost of operating the SMR process, and the potential additional costs of carbon taxes and carbon sequestration, puts hydrogen production by SMR at risk for significant cost increases—especially in smaller scale operations that might provide the hydrogen needed for fuel cell vehicles. The UCSB team includes a longstanding collaboration on catalytic approaches to natural gas conversion between theoretical chemist and professor Horia Metiu and McFarland. Together with chemical engineering professor Michael Gordon, they began investigating the use of molten metals and molten salts as interesting and unexplored catalytic systems. Metiu's theoretical work suggested that different combinations of metals in molten alloys might provide increased catalytic activity for converting methane into hydrogen and solid carbon. The researchers have developed a single-step method by which methane can be converted into hydrogen, which is not only simpler and potentially less expensive than conventional SMR methods, and results in a solid form of carbon that can be readily transported and stored indefinitely. "You introduce a bubble of methane gas into the bottom of a reactor filled with this catalytically active molten metal," McFarland explained. "As the bubble rises, the methane molecules hit the wall of the bubble and they react to form carbon and hydrogen." "You're really allowing yourself to pull all the products away from the reactants and that causes the equilibrium to be shifted toward the products. The process in principle can operate at high pressure and still get very high methane conversion," McFarland said. "If the entire world is wealthy, then wind and solar would be sufficiently low cost to be widely deployed, but it's not cheap enough for the world that we have today," McFarland said. From an emissions standpoint, he continued, it is particularly important to deploy low-cost, low-emissions technologies in places such as China, currently the world's largest emitter of greenhouse gases. India and Africa, which have enormous and growing hydrocarbon consumptions, would benefit from such technology also; they are not rich enough yet to have the luxury of solar panels. The ecosystem for a hydrogen energy system is less deployed than one for solar and wind. That statement makes no sense. Solar is coming in as the cheapest source currently. If this system would truly reduce electricity generating costs below solar - this would be awesome. You still have to look at the externalities - if you are fracking for methane. I could see this as a great complement to solar - rather than using batteries. I don't think anyone suggests we are looking for adoption of a single energy source. Every option has externalities and it will be about how they work together. You are right that people seem to overstate the cost of solar for some reason. Probably because of the entrenched subsidies that hide the cost of coal. Key People Who own Gas Reaction Technologies, LLC. Gas Reaction Technologies Inc. (GRT) has major R&D programs with several global oil and gas companies. Wondering what process they use to make it molten. The authors are dancing around saying that batteries are too expensive. Still, pure carbon is easy to sequester, and it's easy to make methane from atmospheric carbon, so all in all this could work pretty well. For instance, if we use spare daytime solar capacity to power algae farms that produce methane, then use this process and a hydrogen turbine to produce energy at night, we end up storing energy and sequestering carbon at the same time. I'm willing to accept if this makes an oil company rich in the process, at least until we get things balanced. CH4 -> C + H4 is not an exothermic reaction. Where is the energy coming from the power the reaction? You are right that people seem to overstate the cost of solar for some reason. Probably because of the entrenched subsidies that hide the cost of coal. But comparing solar power to coal is begging the question, since coal is on the way out regardless - because of natural gas: methane. So the competition isn't between solar and coal, but solar and methane, and methane is far cheaper than solar - the question is whether methane can be used without creating CO2 emissions. If so, why not use it? The irony is that solar power can't be made without CO2 emissions either, because the refining of silicon from silicon dioxide (sand) involves a shift reaction with carbon, and the cheapest source of carbon is... fossil fuels. But no one is saying that fossil fuel use will be phased out completely. In fact, we can use those resources way more efficiently if we stop burning it for energy! CH4 -> C + H4 is not an exothermic reaction. Where is the energy coming from <(TO)> power the reaction? It's a (sort of) distillation process.